Voters across the Isle of Man went to the polls on Thursday for the general election. 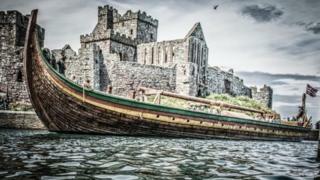 Twenty-four people were elected to serve in the House of Keys - the lower chamber of a parliament first established by Viking settlers more than 1,000 years ago. The first historical references to Tynwald -the world's oldest continuously sitting parliament - can be found in the Chronicles of Mann. The Latin manuscript, held at the British Library in London, makes reference to the original Tynwald meetings which were established sometime between the 11th and 14th Century. The document was written at Rushen Abbey and is one of the most valuable sources of Manx history. It tells the story of the Viking settlement on the Isle of Man which brought together Scandinavian Paganism and indigenous Christianity. Despite this potentially volatile merger, experts tell us it was a relatively peaceful transition. Andy Johnson from Manx National Heritage (MNH) said: "There is no evidence pointing to a bloody clash of culture. "Instead the Vikings seem to have married into the population and exerted their influence that way. "They absorbed Christianity from the indigenous population and very quickly they assimilated themselves. "At the same time though, they did hang on to their language, place names and other traditions." One such tradition introduced islanders to the concept of early democracy, played out in a ceremony which still exists today. The Vikings established an annual public open-air meeting held at the height of summer. In old Norse this gathering was called Thingvollr - 'thing' meaning assembly and 'vollr' meaning field. The purpose of the meeting was to settle disputes between neighbours, something which morphed from a town meeting into what we would now call a parliament. A similar event, Tynwald Day, is still held every year on Tynwald Hill in St. John's. "Archaeologically speaking, there is a good deal of evidence to suggest that this area of the island is important," said Mr Johnson. "There is a Bronze Age burial ground nearby and if you imagine away the buildings you can get a sense of being cradled by the hills at a coming together of route ways to the North, South, East and West - it's like being in at a geographical and intellectual crossroads." Over the years the Viking meeting is thought to have developed into a people's court where new laws were introduced and read out to the nation - a tradition still also observed today. New laws cannot be introduced on the island until they have been "proclaimed" in both English and Manx on Tynwald Day. Clerk of Tynwald Roger Phillips said it is a system which retains its legal impact. "The idea was that if you were not present at the Tynwald meeting and you subsequently broke the law you had no defence. "Even today, if a law is not proclaimed on the hill during the Tynwald ceremony it will lapse - that is a rather pleasing connection to our Viking ancestors. "Everyone was expected to talk about how to end disputes - this was a very important part of keeping the peace and the beginnings of a very early form of democracy." The Tynwald ceremony has continued unchanged, except in detail, for more than 1,000 years and for this reason Tynwald can claim to be the "longest continuous parliament" in the world. Many other Thingvollr meetings were established in Scandinavia but none have endured. "Its continued existence is of fundamental importance to the identity of the Isle of Man," explained Mr Phillips. "Tynwald is the sole reason the Isle of Man never became a part of England - in the 18th Century this was certainly was on the cards. "Without it the island may have been incorporated into an English county - somewhere like Cheshire. "The fact that Tynwald still exists today means we don't look to Westminster- the UK is not entirely irrelevant to the island - but it is a neighbour rather than central government," he added. It is this feature of Manx governance which attracts attention from all over the world.